If your mama names you after a president, you might feel an obligation to make your life a little more meaningful and special. Maybe that's what inspired Woodrow Wilson Guthrie to make such a joyous noise unto the Lord with his thousands of songs, folk tunes about his growing up years in Oklahoma's Dust Bowl, political, children's, songs of wanderlust and traveling, songs of peace and against war, social justice and even songs with a Jewish flavor. None of his verses is more well known than "This Land Is Your Land," that he penned in 1940, considered one of folk music's most famous tunes. Even that was a protest against the sentiment he heard in Irving Berlin's "God Bless America." To learn about the man Woody Guthrie and his life and his music, mosey on over to TheaterWorks, 233 Pearl Street, Hartford for "Woody Sez" until Sunday, September 14. The opportunity to make the acquaintance of this unusual talent is yours for the taking and you will be the richer for saying "Howdy" and metaphorically shaking Woody's hand. The team of David M. Lutken and Nick Corley gets full credit for this production which they conceived together. Lutken stars as the prosaic philosophizing guitar playing guy who was compelled to ramble across the country and write about all he saw and all the people he met along the way. Nick Corley sets his hand to directing this impassioned yet humble tale, of a man and the music he had to make. Think of Woody Guthrie as an amalgam of Will Rogers and Pete Seeger, a man filled with words and sentiments which he put into poems, plays, letters, a newspaper column called "Woody Sez," song lyrics as well as novels and artwork. He suffered many tragic losses in his life as well as great happiness. They translated into his writings. As Woody says himself, "There's a feeling in music and it carries you back down the road you have traveled and makes you travel it again. Sometimes when I hear music I think back over my days - and a feeling that is fifty-fifty joy and pain swells like clouds taking all kinds of shapes in my mind." Accompanying Woody's character on stage are musicians David Finch, Leenya Rideout and Helen J. Russell, who create a powerful storm of sound with almost three dozen tunes. Some highlights include "This Train Is Bound for Glory," "Sinking of the Reuben James," "The Ballad of Tom Joad," "Riding In My Car," and, of course, "This Land Is Your Land." For tickets ($50-65, seniors $35 at Wednesday and Saturday matinees), call TheaterWorks at 860-527-7838 or online at www.theaterworkshartford.org. Performances are Tuesday, Wednesday and Thursday at 7:30 p.m., Friday and Saturday at 8 p.m., and Saturday and Sunday at 2:30 p.m., plus a Wednesday matinee September 10 at 11 a.m. for children, who are free that day. A sing-along jam session, Hootenanny Sundays, are open to all, free, bring a musical instrument, at 4:45 p.m. each Sunday. Visit the gallery upstairs that is showcasing a varied display of musical instruments. On September 23, a 3-CD Deluxe Audio Book, narrated by daughter Nora Guthrie will be released, entitled "My Name Is New York", ramblin' around Woody Guthrie's town. Look for it. Come meet Woody, his guitar and his friends in this special and moving tribute to the Oklahoma Troubadour. A random act of kindness for a dear friend can translate quickly into the old axiom "no good deed goes unpunished." 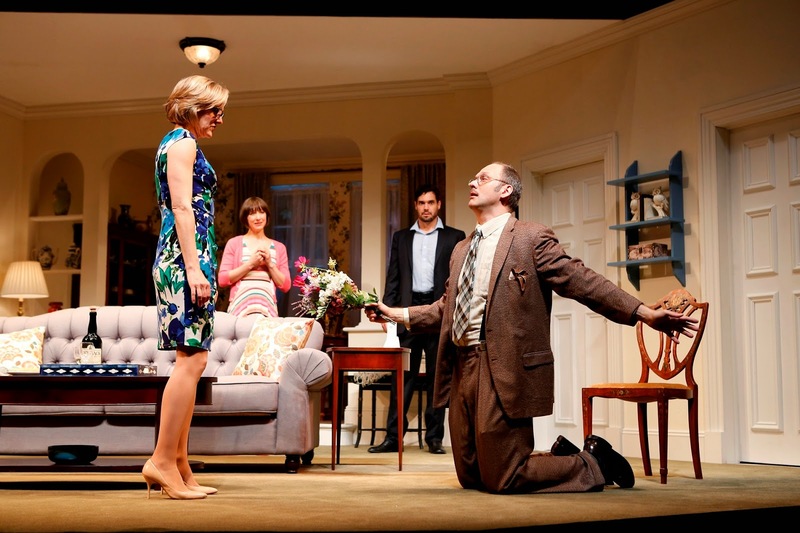 Thanks to the cleverly devious machinations of prolific British playwright Alan Ayckbourn, you will want to witness Westport Country Playhouse's excellently hysterical production of "Things We Do For Love" igniting peals of laughter until Sunday, September 7. When a cynical and undemonstrative Barbara, who was nicknamed "Spike" in her school days, is reunited with Nikki after years of separation, the bonds are quickly cemented. Nikki, who has had a string of disasters in the love department, has finally latched on to a winner, a bearded Scottish vegetarian named Hamish and they need a temporary place to stay while their new home is finished. has a tenant, Gilbert, a handy man/postman living in the basement. Hamish is everything Barbara despices and their mutual dislike is instantanteous and absolute. Yet Barbara is willing to disturb her well organized life momentarily for the sake of Nikki, a woman she pities for her neediness for male companionship. A unique tri-level set, designed by James Noone, gives ample views of the action above and below Barbara's singular space. In this intriguing romantic "square," Nikki and Hamish's relationship is quickly tested as a fascination with Barbara attacks both Hamish and Gilbert, leading to comic and violent complications. The cast is uniformally terrific with Geneva Carr as Barbara, Sarah Manton as Nikki, Matthew Greer as Hamish and Michael Mastro as Gilbert, under the fine direction of John Tillinger. For tickets ($30 and up), call the Westport Country Playhouse, 25 Powers Court, off route 1, Westport at 203-227-4177 or 888-927-7529. Performances are Tuesday at 8 p.m., Wednesday at 2 p.m. and 8 p.m., Thursday and Friday at 8 p.m., Saturday at 3 p.m. and 8 p.m. and Sunday at 3 p.m.
Come discover how scissors, scrapbooks, sherry, footless socks, single unit plumbing, secrets and Scottish heritage invade Barbara's solitary and sheltered life and turn it effectively inside out and upside down. By all rights, Winfred Rembert should have died five decades ago. At 19, this African-American boy was captured by a gang of angry white men in a Georgia woods and had a noose around his neck for protesting in a Civil Rights march. He was going to be lynched but, at the last moment, the men decided to use him as an example and parade him through the town. That decision was a private miracle for his family and friends and a public joy and celebration for the world. At 69 years of age, Winfred Rembert has enough stories of his heritage to last many more than the thousand and one nights of a Scheherazade. As a self-taught folk artist who began his art career after the age of fifty, he might conjure up an image of Grandma Moses. But Winfred Rembert is his own man and the stories he tells through his art are uniquely his. Born in Cuthbert, Georgia, he was raised by an aunt after his mother abandoned him at three months of age. He rarely attended school and by six was more often in the cotton fields and potato patches earning 50 cents a day for his labors. By the time he turned a teen, he had run away from that hard life, hung around pool halls and learned about the Civil Rights movement. He was arrested for protesting and there followed terrible years of abuse when he was almost lynched and sentenced to 27 years in prison. Thankfully, due to his own ingenuity, he learned to read and write from other prisoners. More importantly, he discovered his talent for working with leather and creating an art form that testifies to and celebrates the sorrows and joys of his life. Out of prison after seven years, through the intervention of a California senator, he returned home and continued his courtship of his love, Patsy, and they share the raising of eight children and many grandchildren in their Newhall Street, New Haven home. A natural storyteller, Winfred was encouraged by Patsy to put those stories on leather as a heritage for their children. The wallets and pocketbooks he learned to make in prison have now, for the last 15 years, been transformed into pictorials of his African-American legacy. Prominent in his leather tooled art, that he makes often at night when sleep and nightmares are too painful, are images of rows of cotton fields and the laborers who strain their backs to pinch the bolls from the prickly plants. Another is of Miss Lydie who stopped her picking long enough to birth a baby and then started work minutes later. When Winfred was a babe himself, his baby sitter was told to hang a large white sheet from the line as a signal to his mama in the fields if there was a problem. Winfred Rembert doesn't shy away from the painful memories. He uses his tools, a toe and a heel and a swivel knife, followed by colored dyes rather than paints (paints crack and peel), to create scenes of lynch mobs and chain gangs, realities that he knows intimately. Pool halls, dance parlors, his favorite swimming hole when he played hookey, the stores he frequented, the midwife who charges $8 for a baby delivery, jazz singers and even President Obama have all been immortalized. This "true original" has had his life captured in a brilliant film "ALL ME: The Life and Times of Winfred Rembert" by Vivian Ducat and will be shown at Westville's Kehler Liddell Gallery, 893 Whalley Avenue, New Haven on Thursday, August 21 at 7 p.m. Come early at 6 p.m. to see his leather carving demonstration. His exhibit of vibrant and one-of-a-kind art will be on display until Sunday, August 31. Gallery hours are Thursday and Friday 11a.m. to 4 p.m., and Saturday and Sunday 10 a.m. to 4 p.m. and by appointment, 203-389-9555 or online at www.kehlerliddell.com. Winfred Rembert "takes bad situations and turns them into beautiful art as a sign of strength and of remembrance." He recently had an exhibit of his art in a gallery near his hometown in Georgia, an event that proved how far he has come from the scared and hurt little boy. From his experiences, he could well hate the world for all the suffering he endured. Instead he acknowledges his black history and his American history. He also wants the three white Wilson Brothers from Cuthbert who told him he would amount to no good to know how wrong they were. As he proclaims, "I have a dream of working with children in my home, my church, in schools. I can make a difference in some children's lives. I feel the Lord is with me and helps me do and say the right things." He has often opened his home and his heart to runaway children and feels it is his heritage to tell his tale. "By all rights, I should have died when a mob of mean people almost castrated and hung me, but instead let me live. A guardian angel saved me and I am alive to tell my life story. My art will help you to know me." Let Winfred Rembert tell his special story through his vibrant hand-tooled leather pictures. As he succinctly puts it, "I didn't give up. I keep on trucking." RICHARD VETERE, AUTHOR OF "THE WRITERS AFTERLIFE"
How important is fame in the grand scale of life? Quite important, if you feel you deserve it but don't achieve it, especially if your life is cut short and you die at a mere forty-four years of age. As an artist, a statesman, a sports star, an actor, you might understandably feel cheated. For Tom Chillo, a writer ready to burst forth on the literary scene, his sudden death is devastating. Enter the creative, fertile and fantastic mind of Richard Vetere as he explores Tom Chillo's ascent into a unique place, "The Writers Afterlife." There Tom is assigned a guide, Joe, a painter who will assist his adjustments in the hereafter. When Tom realizes he has been placed in the Valley of Those on the Verge, with the ability to see and even speak to the special Eternals, those lucky enough and talented enough to have achieved a level of prominence, assuring they will never be forgotten, he is devastated. With envy, Tom regards The Eternals and desperately wants to earn his place among them. To be forever in the company of Shakespeare, Emily Dickinson, Oscar Wilde and Thornton Wilder is a dream and goal that quickly consume him. In this compelling tale, Vetere, who is himself a writer of some note, having penned plays, poetry, screenplays, novels and also acted, takes the reader's hand and guides him on a literary adventure. As Tom Chillo chats with luminaries like Edgar Allan Poe and reflects that writers much younger than himself, like Keats who died at 26 and Shelley who left this earth at 29, achieved their quest for immortality, he plots how to join their ranks. With a week at his disposal to go back to earth, to convince friends, agents and critics, to change his destiny, to help him achieve notoriety, Tom Chillo must plan incredibly well. He has one chance to do it right. Will the love of a fellow writer, Jennifer, help him in his goal? He knows what makes a great writer: extraordinary use of language, the ability to tell a story, creating memorable characters, dedication to learning the craft and a well of imagination. Does Tom Chillo have the right stuff to reside forever with The Eternals? Read "The Writers Afterlife" (Three Rooms Press, $16.95) and discover the fascinating answer for yourself. Introducing your new prospective mate for life to your parents for the first time is fraught with complications and causes for concern. When both sets of parents meet simultaneously with the new happy couple, it can be joyous, harmonious or, in a few cases, hysterically wrong. If your parents are both men, the situation can be even more interesting. Jerry Herman, Jean Poiret and Harvey Fierstein have conjured up one such dramatic encounter in the merry musical "La Cage aux Folles" which literally means the cage of the mad women in French, but there's room enough for mad men too. Ivoryton Playhouse is wrapping itself in pink boas, tons of feathers and stiletto high heels for this rousing riot of a romp about romance until Sunday, August 31. As manager of a trendy nightclub in Saint-Tropez where men dress exotically as women every evening, Georges, a suave and sophisticated James Van Treuren, takes his unusual lifestyle for granted. His romantic partner Albin, a truly temperamental and trusting David Edwards, has for years been the star of the entertainment as ZaZa. When Georges' son, the result of a one night experimental indiscretion, arrives at the uniquely different family home, he has one request. Jean-Michel, a striving for normalcy Zach Trimmer, wants to come home with his new fiancee Anne, a sweet and innocent Allyson Webb, on his arm. Also arriving to visit will be Anne's parents. The fact that Anne's father (Frank Calamaro) is the head of a Tradition and Morality Party is a definite problem. If her father, the uptight and conservative politician, had his way, all clubs like Georges' would be closed and padlocked. Anne's mother (Samantha Lane Talmadge) follows her husband's directives to the letter. With their "maid" Jacob, a wildly wonderful Phil Young, leading the charge, Georges and Albin try to ready their establishment for the invasion of the principled parents. Happily for the audience, everything goes awry in a frantic farce of complications. Their friend the restauranteur Jacqueline (MarTina Vidmar) tries to help while all the club dancers the Cagelles prance in merry fashion but the ruse of being a traditional family unit explodes like the myth that it is. Songs like "I Am What I Am," "With Anne on My Arm," "La Cage aux Folles," "Look Over There" and "The Best of Times" are wonderful. Lawrence Thelen directs this marvelous musical comedy with white gloved cleverness and a sense of mischief. The elaborate set by Cully Long is worth the trip to Ivoryton all by itself. For tickets ($42, seniors $37, students $20, children $15), call the Ivoryton Playhouse, 103 Main Street, Ivoryton at 860-767-7318 or online at www.ivorytonplayhouse.org. Performances are Wednesday at 2 p.m. and 7:30 p.m., Thursday at 7:30 p.m., Friday at 8 p.m., Saturday at 2 p.m. and 8 p.m. and Sunday at 2 p.m.
and family get new and different definitions. Imagine the marriage of Madonna and Boy George, musically that is, with Joan Jett and Foreigner, as well as MASH mating with The Muppets, with a few Ghostbusters thrown in for good measure. Sounds crazy, no, or just ingenious when it's the brain child of Annie DiMartino, Long Wharf Theatre's unique Director of Education. Oh, and I forgot the best part. All of the above are integral players in a comic tale by the Bard himself, William Shakespeare. From August 21-24, a group of mightily talented teens will produce, under the direction of Annie DiMartino, musical direction by Carol Taubl and stage manager Mallory Pellegrino, their own innovative version of "Much Ado About Nothing." These kids sing and dance and play musical instruments and, of course, act their bodkins and doublets off. In this case, it's the 1980's, not the 16th century, so their mode of dress is go-go boots and neon garb. The action spirals around two sets of lovers, Benedick and Beatrice who delight in throwing witty barbs in a merry war of words at each other to prove how much they detest one another (methinks, they doth protest too much) and Claudio and Hero who fall instantly in love, so much so that they are speechless and can barely utter a word of affection. Enter the princely Don Pedro, just home from war, an amiable fellow who has the burden of an illegitimate brother Don John, a sullen and bitter soul out to cause mischief and grief. Don John sets his sights on the idyllic courtship of Claudio and Hero and decides to disrupt their upcoming nuptials. Luckily his plot is overheard and the usual inept police led by Dogberry and Verges emerge victoriously over the perpetrators of doom Borachio and Conrad and Don John's plot is overthrown. Meanwhile merry mischief is planned in a grand attempt to get Benedick and Beatrice to admit that they secretly love each other. A glorious double wedding ends in a joyous celebration. What is all this you might question. 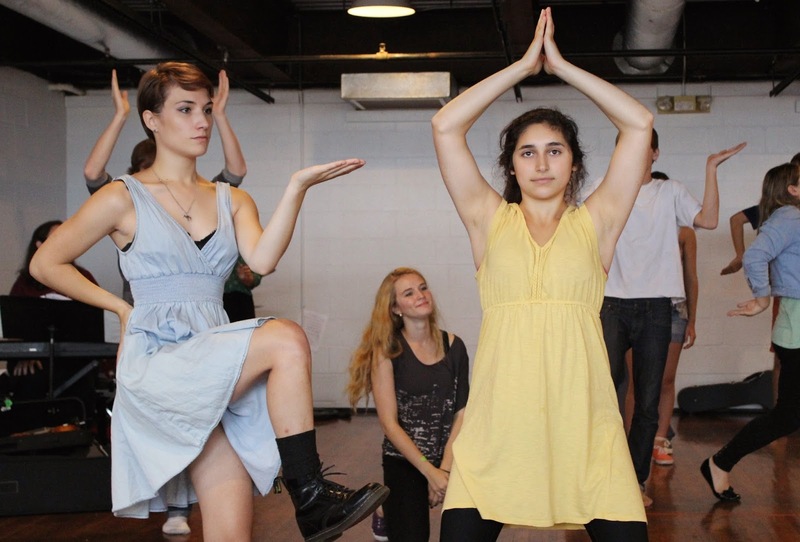 It's the fifth summer of Shake-It-Up-Shakespeare where twenty-five high school and college students audition for and rehearse a full Shakespearian production, alternating tragedy and comedy, with the added enhancement of pop culture and music. Just a glimmer of an idea when Annie DiMartino, a teacher of musical theater at Educational Center for the Arts mentioned it to her class pianist Carol Taubl, it has blossomed into a much anticipated seasonal event. Kids come from all over the state, many returning year after year until they graduate out. All teens from ages 15-21, they learn tools and techniques, character development, script analysis, how to scan Shakespeare's language of iambic pentameter, poetry and verse, as well as songs, dances, their lines and their instrumental parts, all in a brief but stuffed six weeks period. For Rachel Skalka of Woodbridge, soon to be a junior at Boston College, who has been in the program for the third summer, "I think it is outstanding. I was skeptical at first about applying modern music to Shakespeare's text but it is seamless, not at all cut and paste. Even though it sounds campy, there is an emotional depth with the pop music. It's another lens to study the text through." As Benedict's contrary frienemy (friend/enemy), Rachel plays Beatrice. "I've never played anyone similar to myself, a woman who says what's on her mind at all times, for the greater good. She's really cool and who I want to grow up to be...It's so soap opera dramatic." It's clear Annie DiMartino loves Shakespeare, loves teaching children to love him too and loves putting a clever musical spin on her productions. Come see what she's accomplished with "Much Ado About Nothing." Performances are at Long Wharf Theatre's Stage II, 222 Sargent Drive, New Haven on August 21-23 at 7 p.m. and August 24 at 2 p.m. For tickets, a mere pittance at $10, call 203-787-4282 or online at www.longwharf.org. Her message is don't miss the best moments of life due to distractions, like television and movies. Watch her students bring her novel theatrical and musical concepts to brilliant life...it's much ado about something special. L'Chaim-to Life to "Fiddler on the Roof"
When Tevye the milkman married Golde, he met her for the first time under the chuppah, the wedding canopy. Their union was arranged by their parents, as was the custom in the tiny corner of the world, a shtetl in Russia called Anatevka. Marriages also could have been conducted by a yenta, a matchmaker, who made her living "matching" young people for the purpose of matrimony. To meet Tevye and Golde, who now have been blessed with five daughters and a life of poverty, run as fast as you can to Goodspeed Musicals in East Haddam to witness the glorious production of "Fiddler on the Roof," ready to serenade you with joy until Friday, September 12. 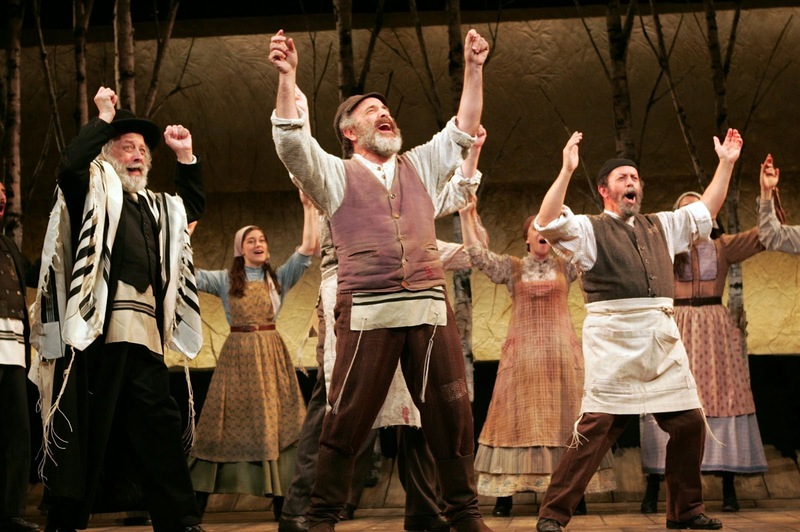 Written five decades ago with book by Joseph Stein, music by Jerry Bock and lyrics by Sheldon Harnick, "Fiddler" is the definitive musical comedy, a classic example of what the finest in Broadway theater can and should be. Max Chucker portrays the fiddler perched precariously on the roof, symbolizing the uncertainly of life. Adam Heller embraces the role of Tevye with complete heart and spirit, at moments tender and compassionate, at others perplexed and concerned, questioning God and asking for His advice. Tevye is a good man, an honest man, a loving father, a patient husband, a hard worker who faithfully delivers milk and dairy products six days a week, even when his horse is lame. Tevye knows who he is and what his role in life is and he accepts them. While he acknowledges his village is inhabited by Cossack soldiers, he adopts a live and let live attitude of co-existence. When he sings "Tradition," he admits the major role his religion, Judaism, plays in his everyday existence. When Yenta ( Cheryl Stern), the matchmaker, arrives at their tiny home, she informs Golde, a devoted wife and mother in the hands of Lori Wilner, that she has news, wonderful news, a match for their eldest daughter Tzeitel, a lovely Barrie Kreinik, with Lazar Wolf (John Payonk), the prosperous but much older widower and butcher. Unbeknownst to Tevye and Golde, Tzeitel has plans of her own to wed Motel (David Perlman ) the poor tailor, an arrangement based on love, one that is unheard of and unacceptable. When Tevye learns of their outlandish ideas, he feels like a willow tree that has to bend. He relents and puts his daughter's happiness first, before traditions. How he convinces Golde to agree, especially after he had sealed his pledge with Lazar Wolf is at the heart of this poignant tale. Soon Tevye is tested again, when his daughter Hodel, a sweet Elizabeth DeRosa, wants to marry the radical student rebel Perchik (Abdiel Vivancos) and finally and irrevocably when daughter Chava, a pretty Jen Brissman, does the unthinkable and wants to cross the line of religious observance to marry the Russian soldier Fyedka (Timothy Hassler). Will Tevye finally break under the burden of change? Each song in "Fiddler" is stirring and emotionally vibrant from "Matchmaker, Matchmaker" to "Sunrise, Sunset," to "Do You Love Me?" and every one in between. The orchestrations are crisp and insightful. This universal story of love, tolerance and forgiveness is directed with tenderness by Rob Ruggiero. The tiny stage at the Goodspeed Musicals vibrates with energy and electricity as dance numbers choreographed by Parker Esse capture the thirsty soul. Nowhere does the pageantry of the spirit soar so high. For tickets ($28.00-82.50), call the Goodspeed Musicals, on the Connecticut River in East Haddam at 860-873-8668 or online at www.goodspeed. org. Performances are Tuesday at 2 p.m., Wednesday and Thursday at 2 p.m. and 7:30 p.m., Friday at 8 p.m., Saturday at 3 p.m. and 8 p.m. and Sunday at 2 p.m. and 6:30 p.m.
Come help Tevye grapple with the immense questions of faith that swallow his small world as he bends and sways in the breezes of change. Even though it's August, proving time does fly in the summer, there is still time to discover a slightly hidden theater gem in New Haven: Yale Summer Cabaret. A few steps back from the sidewalk at 217 Park Street and down a flight of stairs, you will enter a unique entertainment space that for forty years has been offering a combination plate of cutting edge theater and culinary dinners, drinks and desserts. How could it be around for four decades and you never knew about it? For shame. There is still time to discover its secrets. Until Sunday, August 10, co-director Luke Harlan will present "Middletown" by Will Eno. With a passing nod to Beckett's "Waiting for Godot" married and then annulled from Thornton Wilder's "Our Town," "Middletown" is about the people who happen to inhabit one small town, how they think, how they interact, their passions, their problems, their philosophies of life. Here is an average town but look deeper, under the surface, under the friendly veneer to the layer of despair beneath. When Maura Hooper's Mary Swanson moves to town, she is anxious to start a family but her husband is still preoccupied elsewhere. She reaches out to Aaron Bartz's John Dodge, a handyman who is lost in his own maze of doubts. tactics the policeman uses. Librarian (Annelise Lawson) interacts with the tour guide (Shaunette Renee Wilson) and tourists (Julian Elijah Martinez and Jenelle Chu) while Ato Blankson-Wood serves as a public speaker, think narrator, to introduce the play and all the players. Anxiety moves to the forefront in Act II and puts life and death clearly on the line. Nick Hussong has created projection designs that greatly enhance the action. Yale Summer Cabaret will complete its season with a series of one act plays (some as short as four minutes) billed as Summer Shorts Festival by six groundbreaking playwrights who began their careers at the Yale School of Drama. The plays include a trio by Rolin Jones and one each by Kate Tarker, Hansol Jung, Mary Lewis, MJ Kaufman and A. Rey Pamatmat, all directed by Jessica Holt and Luke Harlan, and some especially written for the Cabaret. They will play the weekend of August 14-17. Come early and enjoy dinner from an eclectic menu of offerings, like watermelon gazpacho ($6) to pork ribs and baked beans ($15) to strawberry rhubarb pie ($5). For 8 p.m. shows Tuesday to Saturday, dinner starts at 6:30 p.m. For 7 p.m. Sunday shows, dinner starts at 5:30 p.m. An elevator is available. Reservations are recommended by calling 203-432-1566 or online at summer.cabaret@yale.edu. Single tickets are $15-40. Let the Yale Summer Cabaret, where your waiter can be the co-artistic director and serve you key lime pie one minute and be on stage introducing the show or as a featured actor the next, where the stage is reconfigured for each show to better accommodate the audience, where the theatrical offerings are all edgy, novel and definitely thought provoking, be your own newest discovery. PHOTO BY JUDY BARBOSA OF "AS YOU LIKE IT"
The Forest of Arden is running wild with creatures, from peasants and shepherds to members of royalty and they'd like your company. Feel free to dress in the modish styles of hippies and flower children so you'll feel right at home; bring a sunflower or a bunch of daisies, and skip over to the green grounds of the American Shakespeare Festival Theatre in Stratford until tonight, Sunday, August 3 at 6 pm for Jazz on the Lawn and at 8 pm for the show and later to McLevy Green, 999 Broad Street in the center of Bridgeport, from Wednesday, August 6 to Sunday, August 10. 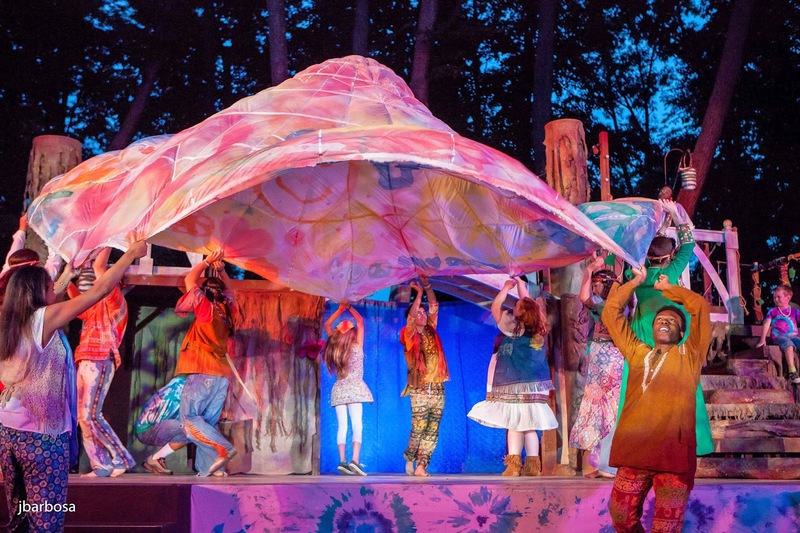 There you'll be delightfully entertained by the Connecticut Free Shakespeare Company's magically romantic tale by William Shakespeare "As You Like It." Imagine an evening under the stars as you lounge comfortably on lawn chairs or blankets (you provide yourselves) and nibble a light evening snack (you provide or purchase on site). This talented troupe of 26, from the ages of 5 on up, will bring this comic tale to life right before your eyes. On a unique woodland set designed by Elizabeth Popiel, bedecked with florals, with magical lighting by Sebastian Pacznski, you will hear the tale of an angry Duke Frederick (Anthony Vaughn Merchant) who has stolen the royal title and exiled his older brother Duke Senior (also portrayed by Anthony Vaughn Merchant) into the Forest of Arden. Frederick has permitted Duke Senior's daughter Rosalind, a delightful and daring Hannah Dubner, to stay at court to keep company with Frederick's only child, Celia, an adventurous Caitlin Chuckta. These are not the only two brothers divided by enmity. Oliver de Boys, a spiteful Eric Brian Nyquist, after inheriting their father's fortune, denies his brother Orlando, a spirited Mark Friedlander, an education, so Orlando enters a wrestling match against the champion Charles, a combative Ian Eaton, and, to everyone's surprise, wins. Orlando's act of foolish bravery causes Rosalind to fall in love with him, and vice versa, but Oliver's increased fury makes Orlando flee to the Forest of Arden to save his own life. True to the Bard's plot turns, Rosalind follows him, disguising herself as a male page, Ganymede, while Celia runs away too, playing Ganymede's sister. Once in the forest, Cupid's arrows fly hither and yon as the country folk Audrey (Liliane Klein) is pursued by William (Scott Redmond) and also by the court jester Touchstone (Jacob Heimer). The shepherdess Phoebe (Regina Gibson) is chased by Silvius (Alton Alburo) but she has her heart set on Ganymede (Rosalind in disguise). When Orlando, who is busy posting poems of love to Rosalind on every tree in sight, meets Ganymede, she/he determines to cure him of his affections for Rosalind. As one of the Bard's favorite tricks, when all seems lost, everyone finds their true love, all the plots of revenge are foiled and "all's well that ends well." This Equity cast, under the excellent direction of Ellen Lieberman and Executive Producer Bert Garskof, puts their hearts and souls into making sure everyone has a great time. The serenading of 1960's music is a delight. Only Jaques, (Ian Easton), the middle of the de Boys brothers, shuns this frivolous life and decides to enter a religious order. Perhaps if he listened to the wise advice of Corin (Katie Sparer), a country philosopher, he would be happier of heart. How could anyone hear music of the Beatles and be anything but groovy? While the performances are free, donations of all sizes are most welcome. A special added treat at Friday night's show were the guests from Victoria, Australia, Ontario, Canada, Prince Edward Island, Canada, Warwickshire, England and Taranaki, New Zealand who are in Stratford CT as part of the Stratfords of the World Reunion 2014. A room of the American Shakespeare Festival Theatre has displays of photographs and costumes from the years the theatre was in its former glory. Be sure to visit it if you go. Pack a picnic and the kiddies and let CT Free Shakespeare entertain you with tales of revenge and romance.